Star Magic, the talent management arm of ABS-CBN finally launches their Star Magic Catalogue for 2012 which features their brightest stars. 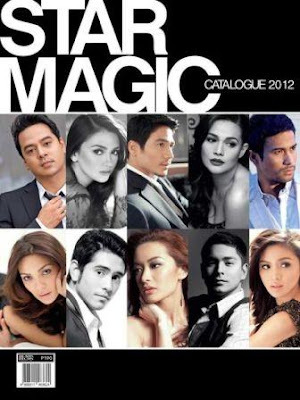 More than 300 Kapamilya stars are being featured in the Star Magic Catalog. But in the cover of it, their top 10 stars, the brightest of them all were on the cover! The stars who were always expected in the cover every year are John Lloyd Cruz, Angelica Panganiban, Piolo Pascual, Bea Alonzo, Sam Milby, Gerald Anderson, and Kim Chiu! But for this year, there are 3 newbies on the cover. They are KC Concepcion, Maricar Reyes and Coco Martin.